By increasing your readership, you increase your authority with search engines like Google. This is where we come in. We’re pros when it comes to business. By adding your business blog to our site, you increase your readership. Your blog visibility increases as does your site traffic. This is called leverage, and we use it to the benefit of business blog writers like you. You must write your blog yourself. No aggregators will be featured; we’re looking for real bloggers that are writing their own blogs. You need to fill out the request form on this page. You’ll be emailed the “Featured on StartingaBusiness.com” badge. You can install it as a widget or put it directly on your blog if you’re a coder. 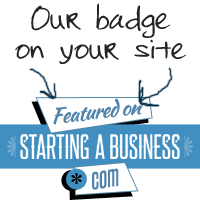 Once you have the “Featured on StartingaBusiness.com” badge on your site, please respond to our email that we gave you the badge with, that you’re live.